The Big Ben Clock Tower in the Houses of Parliament in London England is no doubt the most famous of clocks in the world. 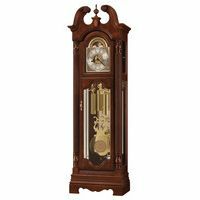 Its classic Westminster Chimes have become the choice favored by millions in the clock collectors world, especially for grandfather clocks. 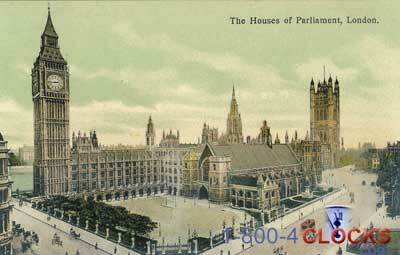 Below is a picture postcard of Big Ben and the Houses of Parliament circa 1910. Also below, and even more fascinating, are pictures and facts regarding "Big Ben", including the works and Dial and movement ALL ON THE INSIDE! The book that these photos and description came from was also published circa 1910. 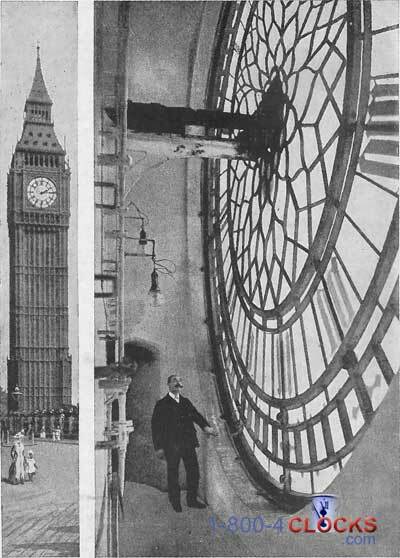 So look below at the Big Ben Tower Clock and step back into TIME almost 100 YEARS AGO. It has not changed! At the top of 360 steps in the Clock Tower at Westminster, Big Ben has marked time for London for over hundred and fifty years. It is not possible to realize the size of the clock as we stand on the ground. It has four faces, each 23 feet across -- nine or ten times as wide as a door. 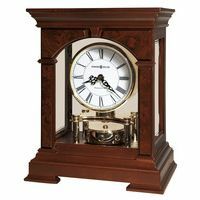 The minute hands are 14 feet long, and are higher than an ordinary room. The pendulum weighs nearly 450 lb. The figures on the face are each two feet long, and the minute spaces are a foot square. If you look at your watch, you will see the minute hand move in little jumps ; the minute hand of Big Ben jumps half a foot every time it moves. It is not easy to believe these figures, but that is because our eyes deceive us when we look up to a great height, and Big Ben stands so high that if thirty tall men stood on one another's shoulders the top man would only touch the middle of its face. Big Ben is the great bell which strikes the hours at the Houses of Parliament. It is made of copper and tin, and is nearly 8 feet high and 9 1/2 feet wide at the bottom. But Big Ben is not the largest bell in London. The largest is Great Paul, at St. Paul's Cathedral. Great Paul weighs 17 1/2 tons, and its hammer weighs 180 lb. Big Ben needs a workshop all his own. 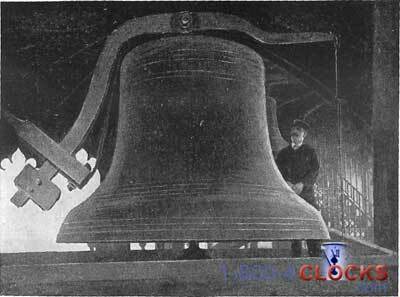 The great bell, from which the clock takes its name, hangs by 1,600 feet of chain from an oak beam bound in iron plates. It weighs 13 1/2 tons, and the hammer with which the hours are struck weighs about 450 lb. 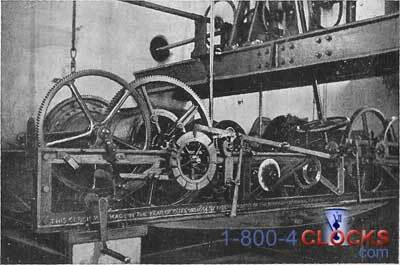 There is a great noise in the room when the bell is about to strike, and the machine shown in the bottom picture has to be wound up three times a week to give Big Ben the power to strike the hours. It takes two men about five hours to wind up Big Ben for striking. HE clock-face has a ring of large figures from 1 to 12 ; these mark the hours. Outside these large figures is a ring of tiny marks ; these mark the minutes. One of the hands is longer than the other ; the long hand marks the minutes and the short hand marks the hours. When the short hand points to 1 and the long hand is exactly at the top of the clock-face over 12, it is 1 o'clock. When the short hand points exactly to one of the large figures, the long hand is always at the top, and it is exactly the hour. But if the short hand is a little past one of the large figures it is some minutes past the hour, and we know exactly how many minutes it is by counting the tiny marks on the outer ring. There are five of these marks between each of the large figures, so tha t when the long hand is at 2 it is 10 minutes -- twice 5 minutes -- past the hour. The minute hand goes round the clock one in an hour ; the short hand goes from one large figure to the next in an hour. When the long hand is a quarter of the way round, it is a quarter-past the hour to which the short hand points ; when the long hand is half-way round, it is half-past the hour. Here is a full and simple explanation of the face of a clock. 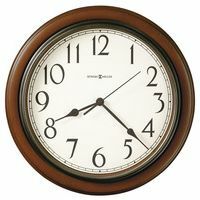 THE face of a clock is divided into 12 clear wide spaces and 60 narrow ones, and each wide space stands for two things. It takes the long hand 5 minutes to cross one wide space, and the short hand one hour to cross the same space. A minute is 60 seconds, and an hour is 60 minutes. The clock begins with the minutes, and the face of the clock is marked off with tiny lines into 60 narrow spaces. The large hand marks the minutes, and takes exactly one minute to cross one of these narrow spaces. So that this hand takes exactly one hour, or 60 minutes, to pass all the narrow spaces round the clock. But it would never do to have 60 small spaces and to leave us to guess the exact space which the long hand touched. Put 60 matches in a row on the table, touch one near the middle, and ask somebody to tell you the number of the match you touch, and you will see that a great deal of slow counting is necessary to get the proper number. It would never do to have to spend so long in finding out the time. So the wise clockmakers mark off 60 narrow spaces into 12 divisions, each division having 5 narrow spaces. When we have to count with our eyes, as we do with the clock, it is hard to pick out one in 60, but it is easy to pick out one in 5, and we have now 12 simple divisions, each with 5 spaces. It takes the long hand 5 minutes to cross one of these divisions, 10 minutes to cross two of them, and 60 minutes, or 12 times 5, to cross them all. When the long hand has crossed all these divisions, therefore, we know that 60 minutes, or one hour, has gone. That is simple. The long hand crosses one narrow space in 1 minute, two in 2 minutes, 60 in 60 minutes. Once round the clock by the long hand is an hour. If we had only to think of minutes, that would be quite enough ; but as we reckon time in hours and days, and as there are 24 hours in a day, we must have some means of counting hours, as well as minutes, by the clock. So the clock is marked off into hours, as well as minutes, and the hours are marked in a very clever way. We do not count 24 hours, but only 12, because twice 12 are 24, and it is simple to count 12 hours before the middle of the day, and 12 after. The clock, therefore, has 12 hours marked, and goes round from 1 to 12, when it begins again at 1. We call the first part of the day A.M., which means before noon, and the second part P.M., which means after noon; and whenever the clock points to 3, or to 4, we know whether it is before or after middle day. The cleverness of the way in which the clock marks the hours is this. We know that the 60 minute marks are marked off into 12 divisions, and there must therefore be 12 dividing walls to separate them. Now, as the clock needs 12 signs to mark the hours, the figures from 11 to 12 are used to mark off the 12 divisions, and to mark the 12 hours as well. So that, instead of needing two clock-faces, one for minutes and one for hours, one face serves for both. While the long hand marks the minutes at the narrow spaces, the short hand marks the hours at the 12 big figures between the spaces.